Finally we have some nice weather in London this week — beautiful, in fact. Sunny with temperatures just below summery — which is totally fine with me. 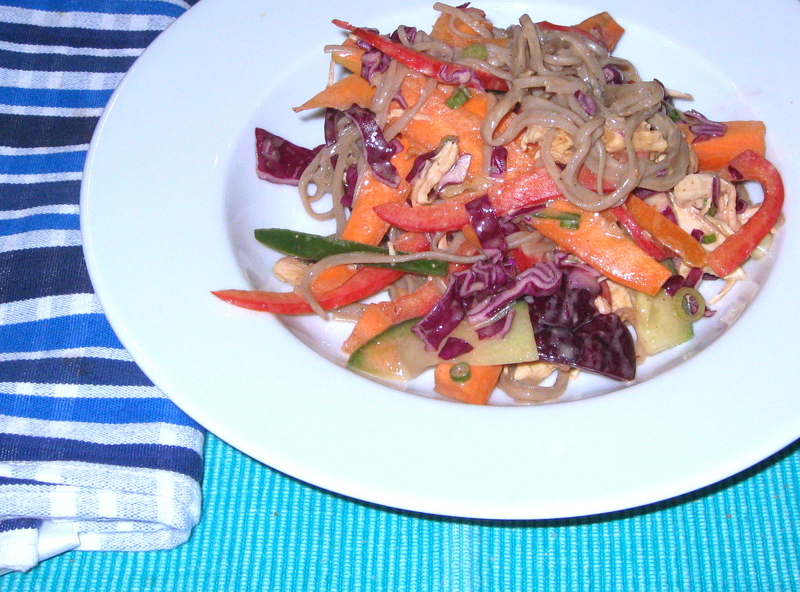 What better way to celebrate that than with a cool, Asian-inspired peanut noodle salad? My recipe was inspired by one on The Cozy Apron. 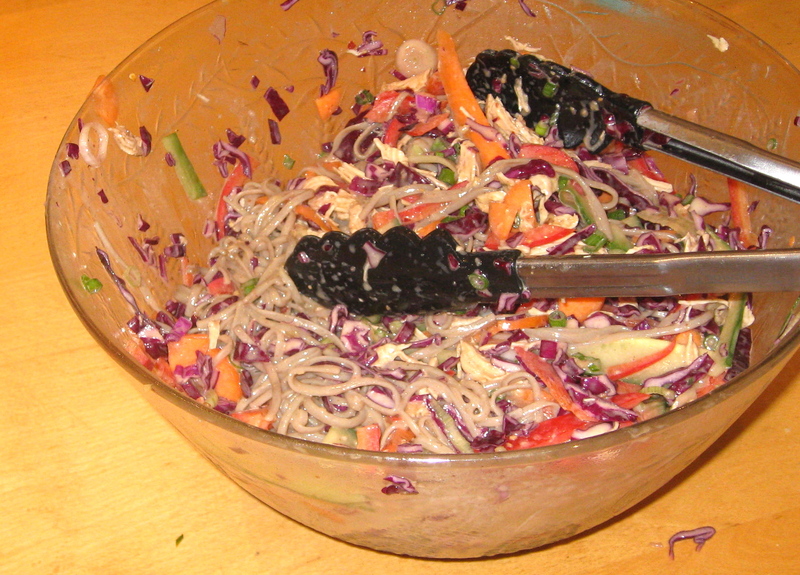 I added more vegetables — admittedly, though, in the rush to get everything chopped and mixed together I forgot the cilantro and peanuts — and used buckwheat noodles (aka soba noodles) instead of regular linguine to boost the health factor. The result? Pure deliciousness. We made a lot on purpose so we’d have leftovers to eat for lunch the next day. Cook the chicken (you can do this the day before or earlier in the day, if you prefer): boil a pot of water and drop in the chicken breasts. Cook at a gentle boil for 20-25 minutes. Let the chicken cool, then gently pull it apart with two forks or your fingers. When you’re ready to begin preparing everything else, cook the noodles according to the package directions, then rinse them well and toss them with some oil. While the noodles are cooking, make the sauce by whisking together all the necessary ingredients. Chop all of the vegetables and throw them into a large bowl. When the noodles are ready, mix in the chicken and sauce, then add everything to the vegetables and mix carefully but thoroughly until everything is combined. Serve cold or slightly warm. This entry was posted in climate, food, full meals, health, pictures, recipes and tagged salad on 05.06.2013 by taplatt.